China’s Maike Metals Group’s MCEC Midwest Commodity Exchange Center is an impressive set of three towers connected at the base by a joint lobby. The Commodity Center is located in the 44.6 square kilometer (4,460 hectare) International Trade & Logistics Park, in the city of Xi’an, the capital of Shaanxi province that is best known for its Terracotta Army. 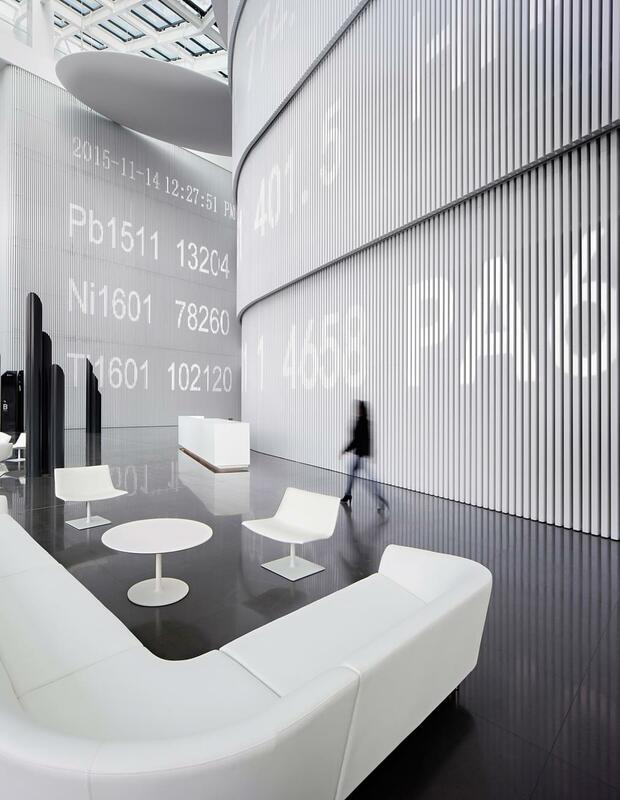 But the best part of the Maike Commodity Center tower project is the cool, white, minimalist interior environment, not typical for a huge company mainly involved in commodity trading as one of the largest suppliers of non-ferrous metals and minerals in China. 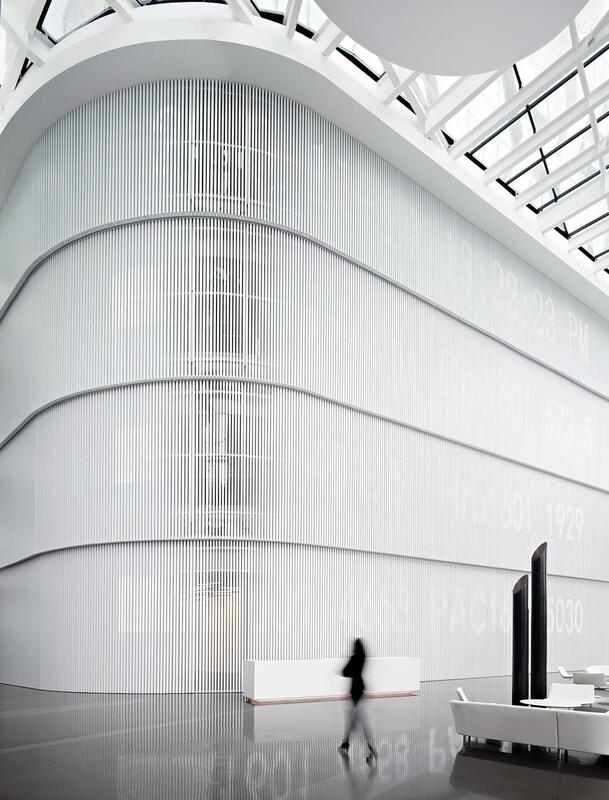 The interior of the Maike Commodity Center is by Hallucinate Design Office. 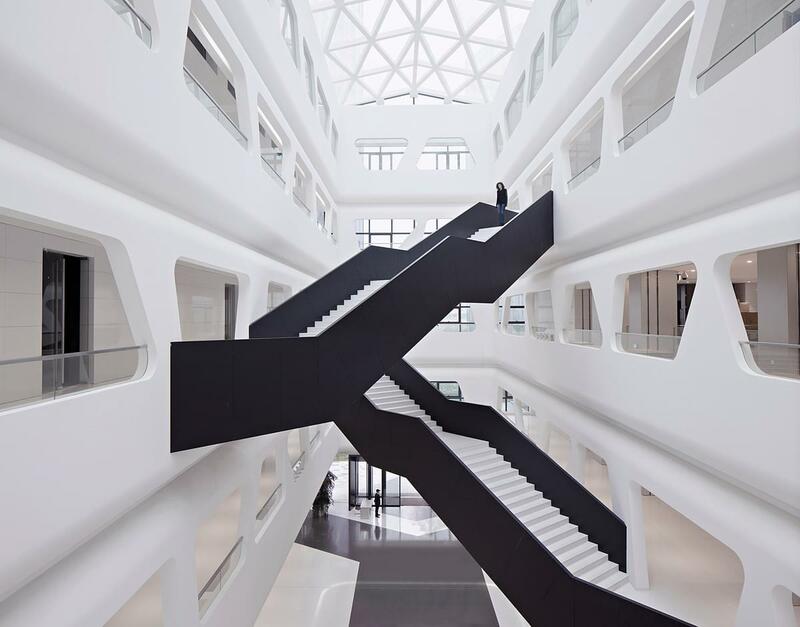 Located in China’s Shenzhen, in Guangdong province, Hallucinate was founded by Wang Wen Liang in 2006. We love the over-arching whiteness, the curved forms and the feel of curved or folded sheets of paper or pages of a book that shows up in several places. 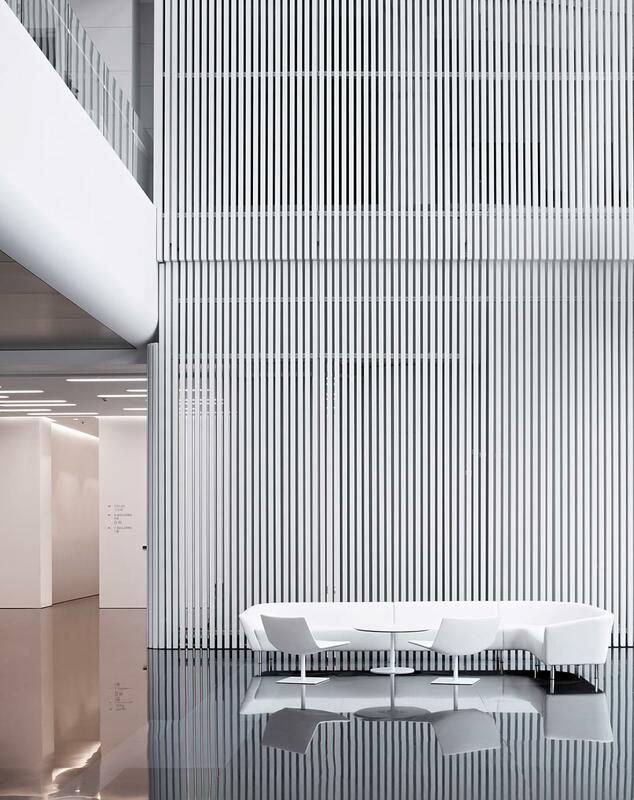 The vast entrance lobby impresses with its high ceiling, its curved screen of spray-painted extruded aluminum slats and its shiny floor of quartz composite slabs. 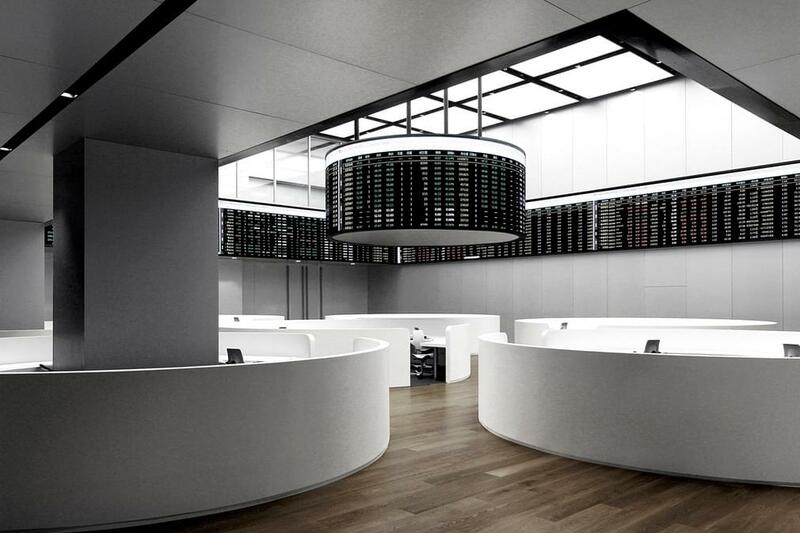 Sleek curved furniture and the lack of distracting details make this area seem like a tranquil decompression zone rather than a stress-driven hive of global commerce. There is a sense of entering a book, of being drawn into it. 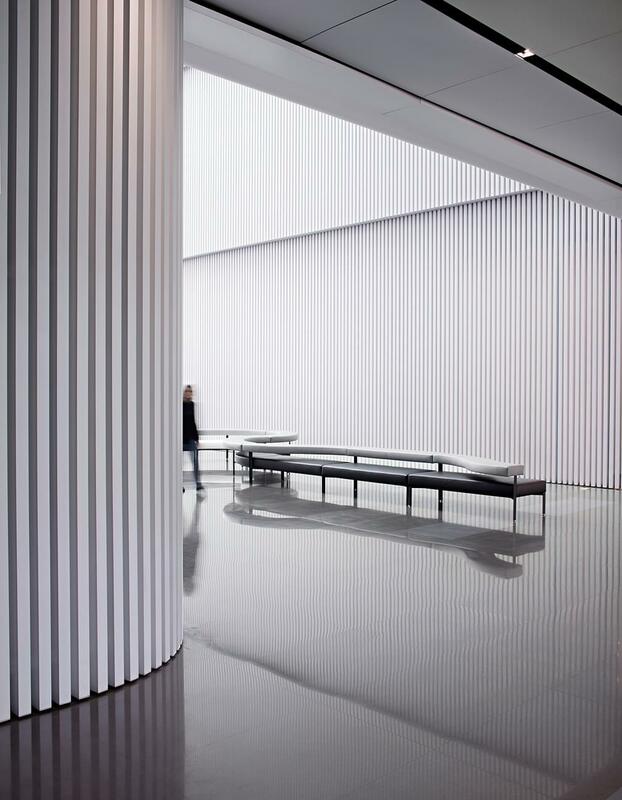 In the central court, with its curved openings resembling a cruise ship interior, stair balustrades in blackened steel contrast with the white quartz composite steps, which again bring to mind accordion-folded paper. In the auditorium, the ceiling echoes the shape of folded paper. Hallucinate says that this is to reduce sound reflections and avoid excessive light onto the presentation screen. 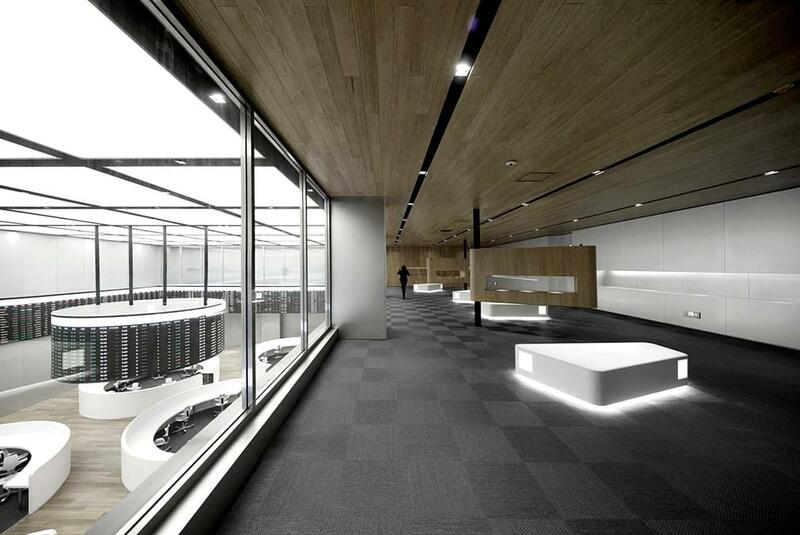 The oak wood seats are arranged asymmetrically to repeat the shapes of the ceiling and to enable convenient movement. Two Tokyo-based firms, Interdesign Associates and Hugo Kohno Architect Associates, were in charge of the architecture of the towers.